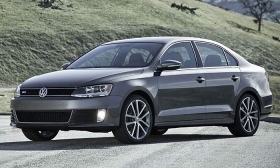 The turbocharged four-cylinder engine in the 2012 Volkswagen Jetta GLI is rated at 200 hp. CHICAGO -- The 200-hp Volkswagen Jetta GLI is here, breaking cover on Tuesday at the Chicago auto show. More-basic trim levels have been shown, but this model adds the 2.0-liter turbocharged four-banger that also serves up 207 lb-ft of torque low in the rev band. This new GLI starts at $24,265. The Autobahn package adds 18-inch alloy wheels, sunroof and interior upgrades, including a Fender sound system, pushing the sticker to $26,315. An electronics package with navigation and push-button start is $27,215. The figures all include destination/transportation charges. A six-speed manual transmission is standard and teams with the engine to get an estimated 31 mpg on the highway. A DSG gearbox is expected to add 1 mpg on the highway to the final figures. In keeping with the sporting theme, the GLI gets four-wheel disc brakes punched up by red calipers. There's also the cross-differential system found on the GTI. Inside are sport seats with red stitching, a flat-bottom steering wheel, GLI badging and aluminum accents. The outside is marked by an air intake and tray-shaped front spoiler.